Check out this idea for compact pots and pans storage! This multi-tiered Range Kleen Pan Tree Under Counter Cookware Organizer is a great storage rack that helps to eliminate clutter under the kitchen cabinet and to keep pots and pans in easy access for time saving meal preparation. Holds 14 pieces of cookware including 8 quart stock pot or dutch oven with lids on top. Fits all standard base cabinets 24 inches high x 15 inches wide x 24 inches deep, including those with a 10 inch half shelf. Pan Tree dimensions: 19 inches high x 13 inches diameter. Pans in product picture are not included. Pots and pans organizer Eliminates clutter under cabinet. Tiered stand Does not need a lazy susan or swivel base for access. 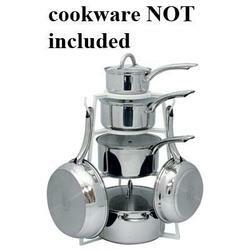 -- Will hold a variety of sizes in pots and pans. -- Organizes a lot of cookware in a small space.